Kind of like sushi in a bowl..But Better. Best Poké bowl in Sydney. At Poke Bros, it’s simple. We’re passionate about sharing our love for fresh, delicious and nutrient-rich food. 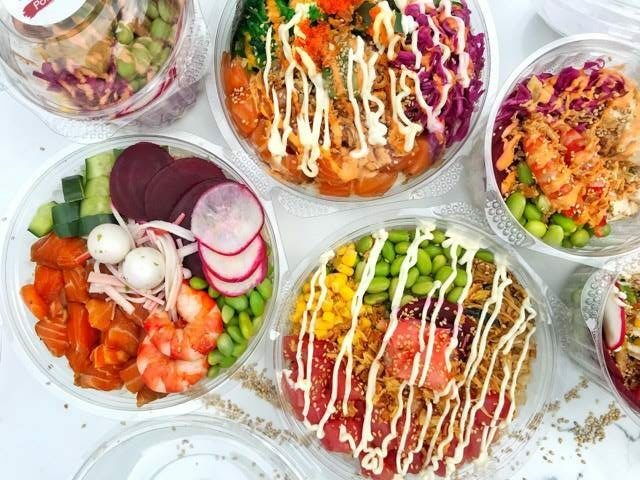 Nourish your body and choose from our favourites or build your own Poke Bowl today. The popular choice is the Premium Salmon Poke Bowl. But this healthy dish can be customizable in any way, with the bite-sized portions of marinated premium Tuna/Salmon/Prawn/Tofu and the wide range of fresh toppings and condiments, topping it off with our flavoursome sauces that’ll really pack a punch, the end result…a delicious bowl made to how you want it. We’ve reimagined traditional Hawaiian Poke and created something we’re truly proud of. Combining flavours of the East with a modern twist. You’ll find a unique balance of flavoursome ingredients that will leave you wanting more. This is one healthy food item you do not want to miss out on. Raw fish holds a strong place in many cuisines. Each culture does it differently. Japan has sushi and sashimi, Latin America has ceviche, Italy does crudo, Scandinavia has gravlax and the Hawaiians have poke! Poke (pronounced POH-keh) means to “cut into pieces” has existed on the Hawaiian Islands for centuries. It has heavy influences from Japanese and other Asian cuisines while representing the diverse culture of the Hawaiian Islands. Just picture all the fresh ingredients and elements that make up a sushi roll… now deconstruct it and serve in a bowl. Come try our delicious poke bowls! Check out our poke bowl Sydney restaurant locations to find a store near you. Dine-in or order takeaway today! Keep up to date with the poké family! Sign up now and receive special deals and the latest updates.